Designed by Zac Overman of Seattle's Sitka & Spruce, this is the perfect prep-ahead summer party drink. Like no other punch I've tried before, it captures the juicy, complex flavor of a ripe strawberry by bolstering that flavor with a few special ingredients. It starts with the berries, of course, plus fresh thyme, tart lemon, and fizzy, bright sparkling wine. 1. For the Strawberry-Thyme Syrup: Add water, sugar, strawberries, and thyme to a small saucepan and bring to a simmer over medium heat, stirring to dissolve sugar. Simmer 30 minutes, stirring occasionally. Strain through a fine-mesh strainer to remove solids. Let cool before using. Syrup can be refrigerated up to 1 week. 2. For the Punch Mix: Combine Strawberry-Thyme Syrup, pisco, Bonal, and lemon in a small lidded pitcher or quart-size Mason jar. (You will have 22 ounces of the punch mix.) Stir to combine. At this point, mix can be used immediately or covered and refrigerated up to 10 hours. Extra Strawberry-Thyme Syrup can be served with seltzer for a nonalcoholic drink. 3. To Serve: Fill each Collins glass with ice. Add 3 ounces sparkling wine and 2 3/4 ounces punch mix to each glass and stir gently. Serve immediately. Peace at last for some vendors who will no longer have to play cat and mouse with officers enforcing the city's sidewalk campaign. 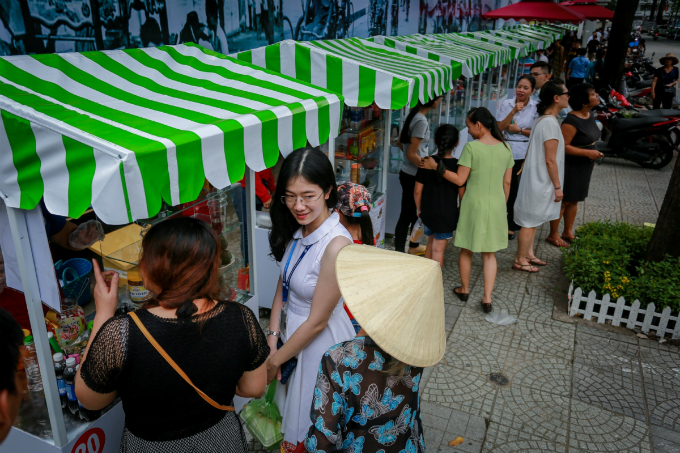 Ho Chi Minh City opened its first street food zone in District 1 on Monday as part of the district’s acclaimed efforts to clean up its sidewalks. If you hadn't already heard, the campaign is taking a zero-tolerance approach to remove cars, bikes, vendors and structures that invade the sidewalks and rob pedestrians of their space. The first zone on Nguyen Van Chiem Street has been designated for low-income vendors who will not have to pay a fee to sell their goods in the zone. Each of the 20 stalls takes up just a third of the sidewalk, giving pedestrians enough room to move around freely. 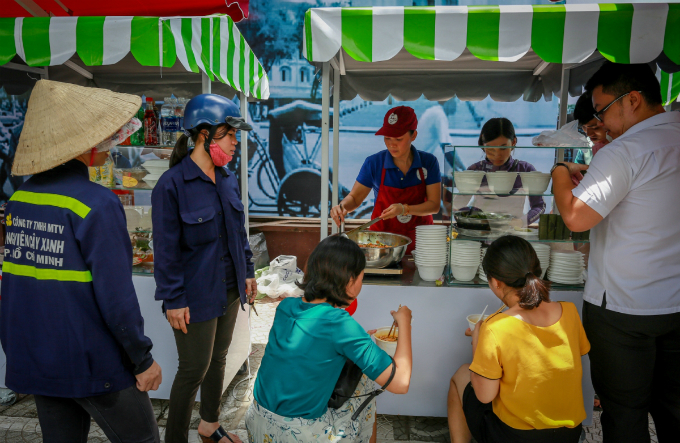 Wearing a uniform provided by district authorities, a vendor named Phuong said she used to sell food in an alley near her home but decided to apply for a license to operate in the new zone as soon as she heard about it. "My family and I received food safety training a couple of days ago. We hope we will earn more money than before here,” she said. Another vendor told VnExpress that she can run her business "in peace" now because she no longer has to watch out for officers and be ready to make a run for it at any moment as before. Vu Ngoc Duong, who works near the zone, said she usually buys street food for breakfast but is always worried about the quality. The street food zone stretches 40 meters on the sidewalk of Nguyen Van Chiem behind the Notre Dame Cathedral, and is open from 6 a.m. to 9 a.m. and 11 a.m. to 2 p.m. The city's second street food zone is expected to open at Bach Tung Diep Park near the Reunification Palace in a month. District 1 authorities started the sidewalk cleanup campaign early in February in a bid to take back the sidewalks for their original purpose and turn the district into a “Little Singapore”. They have put up barriers and deployed police to stop motorbikes from driving on the sidewalks. They have also been towing vehicles, including government and foreign diplomatic cars, and destroying any invasive constructions that spill out onto the street, some of which belong to five-star hotels. The project, led by the district’s vice chairman Doan Ngoc Hai, has been widely applauded by locals, but it has also raised concerns for being too extreme. Street vendors across District 1 are possibly the unhappiest and have been seen crying and yelling when police seize their food stands. The campaign hit a four-month hiatus when Hai mysteriously stepped out of the campaign in April, telling local media that he had to do so as “requested by district leaders”. With Hai’s hands tied, the mission was passed down to local units, and things returned to the old days before resuming earlier this month. * Figures based on This Juicy Water (Oranges and Lemons), Rockstar’s Energy Water, Vimto original (100ml of diluted product), Innocent mango and passion fruit smoothie, full-fat Coca Cola, Ocean Spray Cranberry Classic juice, Pomegreat juice, Sainsbury's red grape juice (not from concentrate), Del Monte Mango & Papaya Juice Drink, Waitrose fiery ginger beer, Shloer Rose Sparkling Juice Drink, full-fat 7up, Asda High Juice Florida Orange Squash (100ml of diluted product). So for those who don’t get excited about plain old water, what is there left to drink? Here are some suggestions to stay hydrated the healthy way. Vicky Bruce, nutritionist with food and drinks consultancy drinkcreate, suggests spiking plain or fizzy water with natural flavourings. Muddle (mash) fresh fruit and herbs in the bottom of a glass – try peaches, melon or berries with mint, basil, lemon verbena or even thyme – and top with ice and water. Or try lemon and lime juice over ice with plain, mineral or tonic water. Even unsweetened fruit juice is loaded with natural sugar but Bruce says adding water makes it a healthy option. Try diluting one part unsweetened fruit juice with four parts water – it will wean you off the taste of full strength juice and curb your sweet tooth. Unflavoured and unsweetened coconut water is another excellent option, says Jackson. “It’s rich in electrolytes for a healthy heart,” she says. Children can take some convincing to drink water so try homemade flavoured milk instead of fruit juice, squash or fizzy drinks. Blitz milk in a blender with a splash of vanilla, cinnamon or dates, or add a couple of strawberries or a banana for a fruit shake.